in may of 2014, aubrey directed at home in the desert. it was a premiere one-act play written by phyllis strupp and produced by many different members of the arizona community including: kiwanis carefree, the desert awareness committee, and desert foothills theatre. it was an official part of the arizona centennial legacy project. throughout the story, chloe feels lost in her new desert home, but she eventually finds her way through the desert and learns to love it with the help of her two guides shown here. while thinking of lighting for this show, i wanted to make sure to bring in a lot of those beautiful desert sunset colors. especially when we walked through the desert and into different 'other worldly' parts of the desert. a lot of the movement during this piece was improvised by the actors. the choreographer and i worked with them a lot to make sure they were fully expressing their character at all times with their bodies. i strove to create a realistic set, with natural desert colors and textures. but, the script calls for living, breathing desert plants and animals. the script demands that kid's move and act like the desert creatures around them every day. in order to create an illusion like this, i used masks that fit atop the actor's heads and had them dress in easy to move, dance leotards. the play centers around a young girl, chloe, who relocated from a more developed area of arizona to a more bare, natural desert area. she feels out of place in this new environment and also feels very lonely having left all her friend's behind. i worked with the actor to bring pieces of her real life experiences into her character. at home in the desert speaks to issues that students face everyday, like bullying and feeling out of place in a new home. the play addressed the topics of adoption and autism and how to speak to and befriend people who are different from you. at home in the desert focused on arizona's fourth grade curriculum about the desert environment. 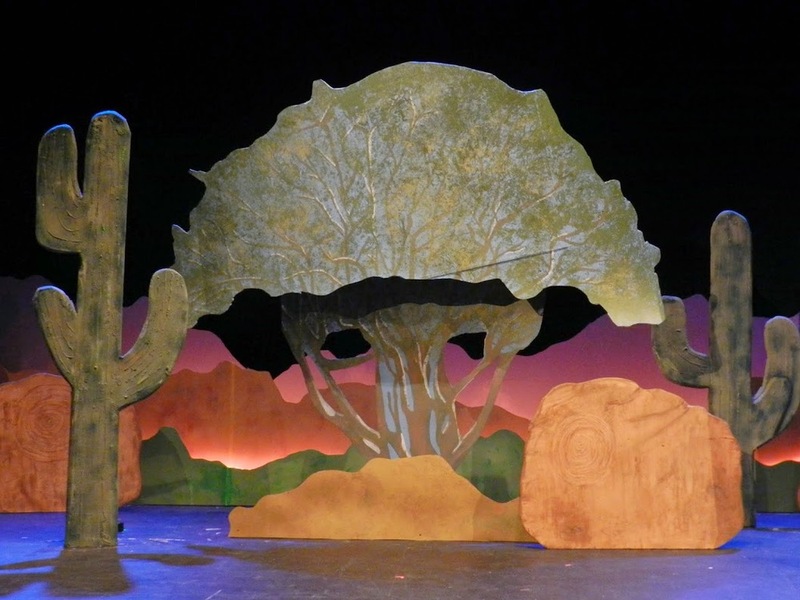 within the play, we learn about various desert plants and animals and how they coexist in our complex ecosystem. the desert set was designed to be easy to move. i wanted pieces like the cacti and the rocks to be able to come 'out' closer to the audience, but to be easy to put back into various positions throughout the show as needed for movement. everything had a natural, desert look and texture.